The AVF Team travels to Angers to take part in an innovative networking platform for the future of food production. 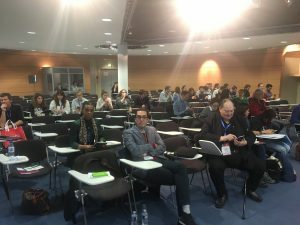 SIVAL, the world-class trade fair for plant production in Angers, France, invited the AVF to take part in their 2019 fair and introduce vertical farming to its extensive audience. With 640 exhibitors from the material and services sectors, and 24,000 French and foreign visitors, SIVAL is France’s premier business and innovation meeting point for crop production professionals. The AVF team (Peter Lane, AVF Vice Chairman, Ramin Ebrahimnejad, Head of Science & Education, and Kyle Baldock, Head of Communications) headed to SIVAL to meet up with our members Urban Crop Solutions, with whom we shared a stand promoting vertical farming. 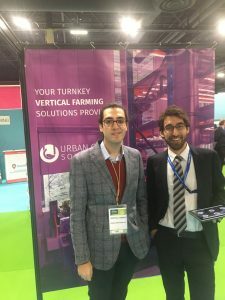 While Urban Crop Solutions was the only company solely dedicated to vertical farming, we met with numerous companies who presented innovative products and services for horticulture, including: varietal innovation, soilless cultivation, lighting solutions, greenhouse equipment, robotics, plant protection and more. In the afternoon of the 15th, we introduced vertical farming to the French audience with technical and promotional speeches. Following the speeches, there was a 20-minute Q&A session featuring Peter Lane, the AVF’s new Vice-Chairman. The conference room was fully packed with a diverse range of interested parties, including many students which we were pleased to see. The AVF used this public forum to engage in many discussions about the current state of vertical farming and best practices in the industry. SIVAL truly is a forum for the future of sustainable food production. Our participation was a success; next year, we plan on returning to SIVAL with an AgriTech Pavilion with numerous start-ups and more physical showcasing of Vertical Farm solutions. Look out for an interview with Nicolas Tsurukawa from Urban Crop Solutions in the blog next week! Merci to Destination Angers, SIVAL, and Urban Crop Solutions for a great event!